We all exercise for different reasons. Some of us love the experience of testing your mettle against all that mother nature has to offer. Others like how a jog outside can break the monotony of treadmills and gym membership. Many cannot afford, or simply cannot handle, gyms so they turn to outside activities to get the most out of their fitness routine. It does not matter what the reason you go outdoors for your fitness regimen is – GPS tracking watches will enhance it. One of the main assets of a GPS watch is its ability to track many different pieces of information simultaneously. Most watches record the following basic information that is important for your training – your speed, the total distance traveled, and the changes in altitude made over the course of your workout. In most workouts without a GPS tracking watch the best you can get for these metrics is the average. Let us take a look at an example to see the benefit of what a GPS tracking device will do for you. If you just did your 7.4 mile trail run in 56:32 you can calculate that you ran an average speed of 7.86 miles per hour. This is important information in and of itself, but what if you can find your actual speed at any given point of the trail? Wouldn’t that help you get a better picture of how you can improve your workout and increase your speed? This is the power that GPS tracking watches provide – and it does so without you having to notice landmarks or check your watch and remember at what time you passed it. Your entire focus can be on hitting the trail, improving your speed, and enjoying all that it has to offer. These graphs are extremely data rich and can really help you better understand your body and the nature of your workouts. They provide information that you would not be able to gather otherwise! Who on earth has the coordination and concentration to keep pace while checking their pulse? Moving your hand away from pumping causes inefficiency of motion and only produces an estimate of your beats per minute. 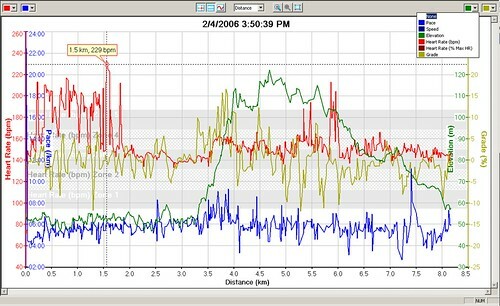 A GPS watch used in tandem with a heart rate monitor is an extremely efficient way to gather this information. In addition to it being efficient, it is also very fun. Having the ability to see the exact locations of your run, kayak, or hike can add an element of adventure that goes beyond the actual experience. Looking at your route from outer space can give you new ideas of paths to take or interesting features to explore. This can be added motivation to improve your fitness even further and to hit the trail when you don’t really feel like it. GPS tracking watches provide everything a person needs for outdoor exercise. The casual adventurer receives added motivation through the fun interface to explore new areas or push themselves to new limits. The more dedicate fitness enthusiast can access the powerful information recorded by the watch for use in analyzing their routine’s weaknesses and pushing their body to new heights of physical exertion. They are the best non-essential devices out there. Any fitness regimen can be enhanced through the use of a GPS tracking watch. They can provide precise travel information ranging from the extremely common to the outrageously awesome. A GPS watch is still a watch, so it can tell you what time it is as well as give you a precise start and end time for your exercise activity. But that it is also a GPS so it can leave electronic breadcrumbs like a digital version of Hansel a Gretel (but without the creepy witch who wants to stick you in an oven and eat you). When paired with a heart rate monitor that invisibly transmits data to your watch it can become one of the most powerful tools in the training athlete’s arsenal. They do this by assisting athletes in analyzing the relationships between heart rate, speed and the changing elevation of the course that is being run, biked, or even swam (swimming only available on selected watches). Many of these watches also let you download this information onto your computer to interact with different types of mapping software. This allows you to interact with your workouts in a way that would be nearly impossible without it happening automatically in the watch’s computer. The mapping features will let you know which parts of your routine caused you to work the hardest. Some models and services even suggest workouts for you to help you improve your fitness level. Garmin currently offers 7 models of GPS tracking watches specifically designed for fitness applications. Of these seven models, four also come with a heart rate monitor. Heart rate monitors are devices that strap around your sternum, with the pickup resting on your chest while an elastic band wraps around your back. As mentioned above, these monitors offer much more information to the user and are highly recommended for those seeking to maximize the potential use of their device. Prices for these models can range anywhere from $99.99 to around $450.00 for the seven models. While you definitely do not need to spend that type of money, these devices can add significant value to activities you already enjoy or need to do for health reasons. Sacrificing twenty nights out at the movies or bringing a sack lunch to work on forty different days might be a trade off you are willing to make to buy one of these devices. This is actually not technically a GPS device. Instead it is more like a fancy pedometer that has some of the same functionality that you will find with the other Garmin GPS tracking watches. It is the cheapest of the watches for this reason. There are versions of it available that have a heart rate monitor so this might be a good option for those just starting out using a watch to assist their fitness regimen. The watch uses a foot pod to measure the distance that a user has traveled. This technology counts each step that a runner, walker, or hiker makes and then tries and determine the distance traveled by using an average of their step distance multiplied by the number of steps taken. This provides a decent approximation of the distance traveled, but it really falls apart when hilly terrain is being traversed. Running up hill shortens the gait while running downhill elongates the gait. Most step counters do not compensate for this discrepancy like a GPS device would because it does not actually measure the distance traveled. This device should probably only be purchased by those looking to keep costs down or who do not train seriously enough to warrant a full fledged GPS tracking watch. This is Garmin’s entry level GPS device for runners, athletes, and walkers. It can seem a little difficult to set up if you don’t have any GPS knowledge, but other than that this device delivers exactly what it promises – a reliable watch that tracks what you want it to. It is supposed to store up to 2 years of training information and has all the features that you would want on a GPS watch. There is no heart monitor with this device. The price on this product is decent, but there are much newer models that really have eclipsed this watch. The greatest shortcoming for those who are really looking to improve their overall fitness level is that no heart rate monitor can accompany this watch. As a result you are left without all the important information that will help you push yourself into the next training level. Runners of all levels should look elsewhere for a fitness watch to meet their needs unless you can find one at a ridiculous price. The next tier up on the *01 series of watches is the 201. This device offers the increased ease of rechargeable lithium ion battery over against the Forerunner 101. This device is also Garmin Connect (Garmin Connect is an online training tool) and Garmin Training Center compatible. These two programs let you seamlessly record your information of your PC and provide powerful tools to help you analyze your workout, giving it some more training edge over its older counterpart. It, however, lacks support for a heart rate monitor in addition to being a relatively overpriced piece of equipment. I would again steer clear of this watch as its blend of features and price tag do not make it worth the money to buy – at least not new anyway. If you can get this used for a price well below $100 you have probably found a good price, otherwise pass on this watch and get the Forerunner 305 or 405. They are much better watches. The 301 is the first in the *01 series of watches that comes with a heart rate monitor. It also has several improvements in the interface allowing you to scroll through past workouts, change sports in the middle of workouts (read triathletes), and the ability to create custom, goal oriented workouts. It too has access to Garmin Connect and the Garmin Training Center. This watch is by far the most advanced of the *01 watches.